Classic Crumb with articles by Ken Kesey who has also signed the front cover. With Kesey’s articles such as “The Bible” and “The I Ching”, there is an amusing advertisment “I Use cornstarch”, as well as other articles by Paul Krassner, and McClanahan on the Grateful Dead. From his steamer voyage from Jazz Age New York to Cap Haitien to his punishing trek through the island's interior jungle to his rapt, yet fearful, attendance at an authentic voodoo ceremony, Loederer captures the sights, sounds, and sensations of this mysterious Caribbean republic. A selection of the magnificent chapter headings tell all... Congo Bean Stew; Massacre River; Jungle Magic; Tropical Fever; Polychromata; Black Magic; Voodoo Fire. 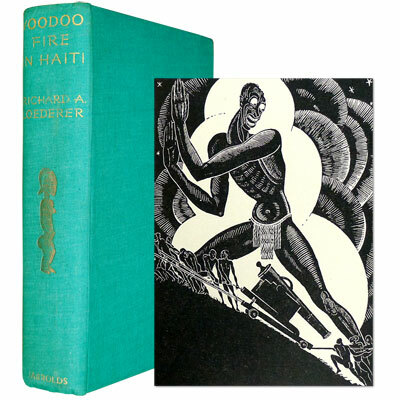 Illustrated by fifty one of the author's own art deco-style woodcuts, and his wonderful piratical map of Haiti used for the endpapers, which only add to the exotic appeal. A superb example of this large, limited edition of Grimm fairy tales, illustrated with twelve stunning mounted colour plates and numerous black and white drawings by Kay Nielsen, and signed by the artist on the limitation page, accompanied by the publisher’s somewhat worn slipcase. Together with ‘Hansel and Gretel’, this marvellous collection also includes the stories ‘The Six Swans’, ‘The Fisherman and His Wife’, ‘Snowdrop’, ‘Clever Alice’, ‘The Valiant Little Tailor’, ‘Rapunzel’, ‘The Three Magic Gifts’, ‘The Golden Goose’, and ‘Rumpelstiltskin’, among others. 1914 - Hodder & Stoughton, London - First Edition, Number 24 of 500 Deluxe copies. A beautiful example of one of the twentieth centuries finest illustrated books, in the large stunning deluxe vellum binding, decorated in blue and gilt, numbered and signed by the Danish illustrator Kay Nielsen. The marvellous collection of fifteen Norwegian folk tales ‘Norske Folkeeventyr’ gathered by legendary Norwegian folklorists Peter Asbjørnsen and Jørgen Moe on their journeys across Norway in the mid-nineteenth century, and translated into English, perfectly enhanced by Nielsen’s spectacular artwork, which is presented on twenty-five tipped in colour plates, twenty-two black and white illustrations, numerous decorations, borders, and gilt and black illustrated endpapers. ‘As for the murders, let us enter into some examinations for ourselves, before we make up an opinion respecting them. An inquiry will afford us amusement’ - Monsieur C. Auguste Dupin. Presenting Poe’s three pioneering detective stories - ‘The Murders in the Rue Morgue’, ‘The Mystery of Marie Rogêt’, and ‘The Purloined Letter’. In these three short tales ‘Poe originated an astonishing number of conventions in detective fiction. The brilliant detective, the locked room mystery, and the bungling inept police are among the more obvious. The use of sleight of hand – placing all clues in sight while leading the reader to regard the from a point of view that will not reveal the truth–is another of Poe’s inventions. His construction of the detective story has become classic. The most salient feature of Poe’s detective tales is the introduction, as narrator, of an unnamed voice, the contrast with whose bland and obtuse normality dramatises the genius of the detective’ - Rosemary Herbert, A Who’s Who in Crime & Mystery Writing. In addition to Poe’s three detective stories, a further of twenty six tales are contained within this finely bound tome, including ‘The Cask of Amontillado‘, ‘The Fall of The House of Usher‘, and ‘The Tell-Tale Heart’. Powerfully illustrated by Arthur Rackham with twelve colour plates and seventeen black and white drawings. 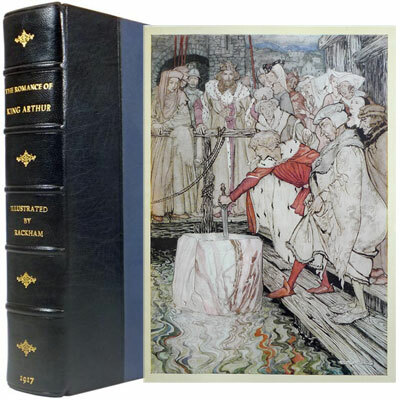 An exemplary copy of this celebrated collection of Arthurian legends, wonderfully embellished with Arthur Rackham’s dramatic illustrations, with 16 full page colour plates, including frontispiece, each one with descriptive tissue guards, together with several other full page and in-text black and white illustrations throughout. Abridged from Malory’s Morte D’Arthur by Alfred W. Pollard. A bright copy in the scarce dust jacket – illustrated and designed by N.C. Wyeth – of Kenneth Robert’s historical account of the saga of the Arundel, and the intrepidity of the American privateers. The setting is March 1812 to April 1815. Merchant captain Richard Nason is trading with the British, carrying supplies to the British Army in Spain, and is generally opposed to the war, when he is pressed aboard a British Royal Navy sloop. His attitude changes and (after escaping) he takes a privateer to sea in July 1812 after war is formally declared. Nason falls in love with the young wife of an older English landowner, Sir Arthur Ransome, first meeting her before the war, then again aboard a ship he captures. 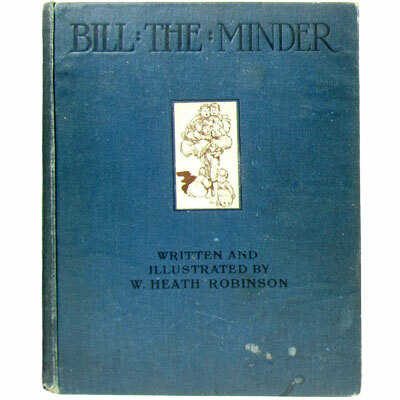 A lovely collection of stories by William Heath Robinson, profusely illustrated throughout, with four mounted colour plates and over one hundred black and white drawings, featuring a selection of the fabulous comic contraptions for which he is renowned. The stories included are: Bill the Minder, The King of Troy, The Ancient Mariner, The Triplets, Good Aunt Galladia, The Doctor, The Respectable Gentleman, The Sicilian Char-Woman, The Interval, The Real Soldier, The Wild Man, The Musician, The Lost Grocer, The Merchant's Wife, The Camp-Followers, and The Siege of Troy.